The new Hostry at Norwich Cathedral has now officially opened and completes the second phase of the overall redevelopment of the Cathedral cloister, following the completion of the new Refectory in 2004. The new building is placed on the site of the medieval Hostry and uses the archaeological remains of the former structure to create a new Visitors’ building for the Cathedral. 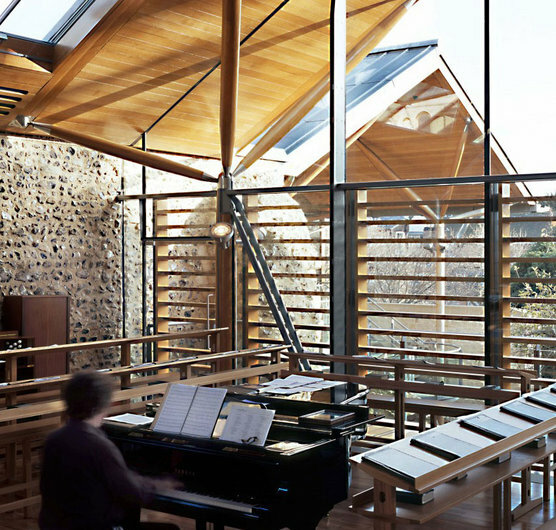 It provides exhibition and education spaces and a new Song School for the Cathedral Choir. A large community room offers conference facilities for external groups and brings together those who live and work in The Cathedral Close. Together the new building re-establishes the Cloister as the heart of circulation in the Cathedral precinct.